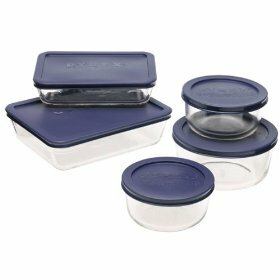 Glass food storage container set. One of the first things we did was replace all our plastic storage containers. We like the glass Pyrex containers. Good for storage, fit easily in the fridge, easy to clean and we can use them in the microwave too for reheating leftovers. But, one day we put our daughter’s lunch in one of these and sent it with her to school. At the end of the day we got a note saying that glass containers were not allowed. I can kind of see their point, but these Pyrex containers are pretty tough, and I still don’t like the idea of my daughter’s lunch being microwaved in a plastic container, even if it is safe plastic – number 5. 1) Had us come home for lunch (only realistic even then, at a certain age and if you lived really close to school). 2) We had the old-fashioned metal lunchbox, usually bought with a thermos. In those days, they were always glass inside, but were very tough and rarely broken. 2) Sandwiches, snacks and fruit like grapes were wrapped in either aluminum foil or waxed paper. OR moms used waxed paper sandwich bags. I don't think they have been available for a very long time, but have never looked into it. My mom would secure the waxed paper wrapped sandwich?oh so carefully?with a toothpick. 3) Cold drinks or hot chocolate, etc. would go in the thermos that came with the lunchbox. That was that, unless you ate lunch at the school cafeteria. (Milk available at the cafeteria or for snacks in the younger grades was always in waxed cartons. When my boys were young, it was similar, but by then, plastic baggies were common and we often used small, lunchbox sized thermos containers for storing hot soup, chili, etc. Plastic drink containers had also become common for fruit juice & punch, etc., though the old style lunchbox itself was still a staple.